Had Real Sociedad delivered their initial plan, Anoeta redevelopment would already be coming to an end. But instead of 2015, works will commence in May 2017. The project will also be significantly more expensive than planned. While back in 2014 Sociedad were hoping to reduce the price tag from €44 million to 40 million, now the final budget is set at €50,745,132. That said, finally now the budget is secured, as ratified by authorities on provincial level (Gipuzkoa province) and regional level (Basque Country). The Basque Country will contribute €10 million, while Gipuzkoa will add further €4 million, leaving Real Sociedad with €36 million to cover. And the club is willing to do it, submitting €24 million now and further €12 million in the longer term. Now the most important thing left to plan is whether Estadio Anoeta will be available to host games throughout the reconstruction process. That would of course be preferable and the club assure most games will be played at home. But a couple of fixtures might be moved to San Mames in Bilbao. Athletic agreed to lend the stadium, returning the favour after having been hosted at Anoeta during San Mames revamp in 2013. 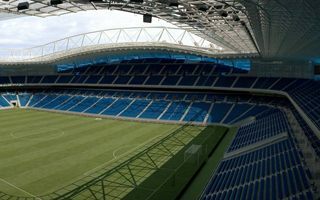 Reconstruction of Anoeta is expected to take 2 years, resulting in a football-specific stadium in 2019. The field will be lowered, spectators moved closer to the field and both end zones rebuilt entirely. New capacity will reach 42,000.